The afternoon we visit, there are a dozen or so members of Blacktown’s African community hanging out the front drinking tea and swapping stories. While inside, we’re served the best Ethiopian food we’ve ever had in Sydney. 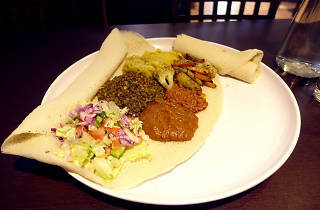 The cornerstone of Ethiopian cooking is a spongy flatbread called injera. It’s got a tart, fermented taste – like sourdough, but even stronger, and it comes with everything. Or, more specifically, underneath everything. Ethiopian food is a hands-only situation (and Blue Nile have a basin for pre-and-post eat wash ups). 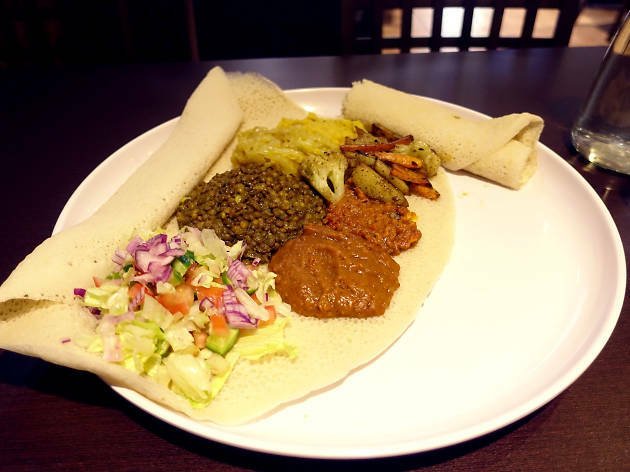 Dollops of different curries are dropped onto a base of injera, while another plate of bread is served on the side, rolled up like napkins. The idea is to tear off small pieces of bread and scoop the curries, stews and braises into your mouth with them, like tiny sloppy joes. The greatest pleasure comes when you eat the base bread that’s been infusing with juices and spices all meal long. We order a mixed vegetarian plate: yetakelt beainetu. Each dish is multi-textural and totally distinct. Puy lentils are mildly spiced and perfectly al dente, cabbage is sweet and fragrant, while beans have a robust, well rounded heat. Next to it is a simple side salad of red onion, iceberg and tomato – all very crisp. The serves are generous and the prices are low. After our meal, we’re brought a refreshing, perfumed Moroccan tea, free of charge. Our server is manning both the front of house and kitchen solo, while her son plays a game in the corner. This juggling act is even more impressive, given everyone in the restaurant seems like a friend stopping by for a chat. Blue Nile’s menu is pan-African (they’ve recently added Somali food to the menu) and they’re not lying when they call themselves a café. In the morning, they have Kenyan omelettes and Ethiopian equalal firfir (scrambled eggs), alongside coffee served in the style of its country of origin.